There are two key scenarios which have been enabled. First, as an analyst, you can use natural language to easily explore your data and quickly author new charts and visualizations using natural language. Secondly, if you wish to allow consumers of the report to perform ad-hoc analysis, you can place a button within a report which brings up the ‘Ask A Question’ experience. This experience offers the consumer of the report the ability to interact and ask their own highly customized questions or pick from a list of suggested questions. 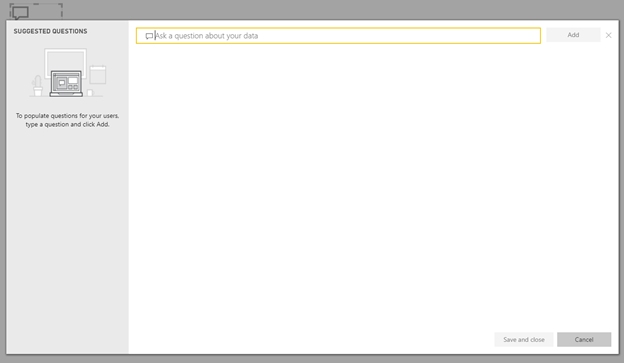 In the buttons section underneath the main ribbon you will now see a Q&A button option. 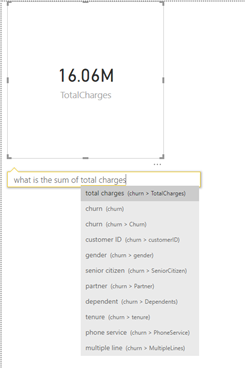 We hope you enjoy the new features we have enabled with ‘Ask A Question’ inside the Power BI desktop. As always, if you wish to share feedback for the ‘Ask A Question’ feature, we are currently collecting feedback via survey to help us figure out what we should prioritize next. The survey should not take more than 5 minutes and we really want to hear your say on where we go next for this feature.